Having seen a LOT of buzz over on Twitter and Friendfeed about the forthcoming N97, I feel compelled somewhat to make a point about this subject, especially as everyone seems to be missing the point badly. I should admit now that I haven’t used an N97, but then neither it seems has anyone else apart from Robert Scoble, so I feel as well placed as anyone to comment. The label ‘iPhone killer’ has become so hackneyed now I’m not sure anyone believes it when it’s applied to a new product, but yet again we see it slapped onto another touch screen wannabe. There’s already a lot of positive hype about this product, which I’m sure will be fairly slick in many ways, Nokia do design some great phones. However, I remain skeptical about the ability of Nokia or Symbian to turn out an OS experience as compelling and slick as the iPhone. The most amusing thing about the comparisons I see is the way that people knock the iPhone because it doesn’t have a 5m pixel camera, or a full qwerty keyboard. Rather than take that as a negative, I take that as a positive sign that the company designing this thing have chosen to focus on a few important aspects of this device and make them really sing, rather than cramming the phone with features, a la Samsung or Nokia and not making any of it brilliant. It is reminicsent of Google’s maxim – take one thing and do it well. 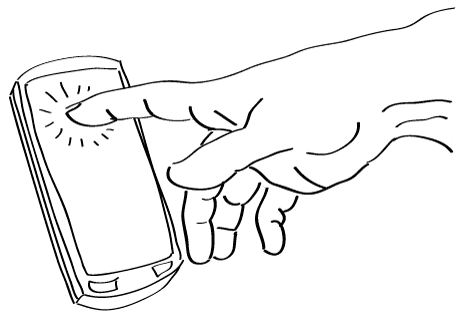 In the case of the iPhone this is the concept of touch. What seems gimmicky turns out to be really intuitive, and breaks down the barriers between you and your objectives with the device, which is the ultimate goal of any UI designer. Interactions become as simple as ‘see what you want – press it’, rather than ‘up-down-left-up-push-left-up’ which just sounds like the commands from some early 80s text-based adventure. It’s also really open, as the screen can then be made to be any type of interface, depending on the needs of the application. As long as the OS and in particular the web browsing experience remains more fluid and simple with iPhones, nothing any of the other manufacturers do will make a difference. It doesn’t matter if you’ve got a 10megapixel-Carl-Zeiss-smoothy-maker-with-added-zing attached, if your core offering – a personal computer that you can make calls with, browse the internet etc fails, what good is the rest of that rubbish? The only thing I hold out any hope for at the moment is Android. I haven’t used it in any form, so I can’t comment directly, however the first iteration does seem to be better than people expected, and at least Google are focusing on the core of the experience on offer, i.e, the OS and the browser, and not thinking about hardware so much. This alone gives it a much better chance I feel. Another plus is the openess of it; rather than developing proprietary applications, they leave the field as open as possible for other people to demonstrate the full potential of the platform. They also seem to be making it possible to add applications on gracefully, something Symbian most certainly does not do. So what can we learn from this? The main thing is that ‘less is more’. It hurts me to trot out such tired cliches, but I think when you’re looking at the objectives for a product, in hardware or software, then you do need to keep it simple. Simple objectives mean more resources applied in a given direction, so more can be done to tackle that objective. Then you just have to hope you’ve chosen the right objectives in the first place.